The Esotec MW 172 is a 20 cm (8 inch) diameter mid/woofer designed for high performance two-and three way systems. The MW 172 will perform extremely well in a wide range of enclosures, either sealed, vented, or free-air. The MW 172 exhibits a unique combination of smooth frequency response, low distortion, and extremely powerful bass to deliver an outstanding sonic performance in any high performance two- or three-way system. The MW 172 utilizes an oversized 75 mm (3 inch) diameter voice coil to drive the MSP one-piece cone diaphragm. 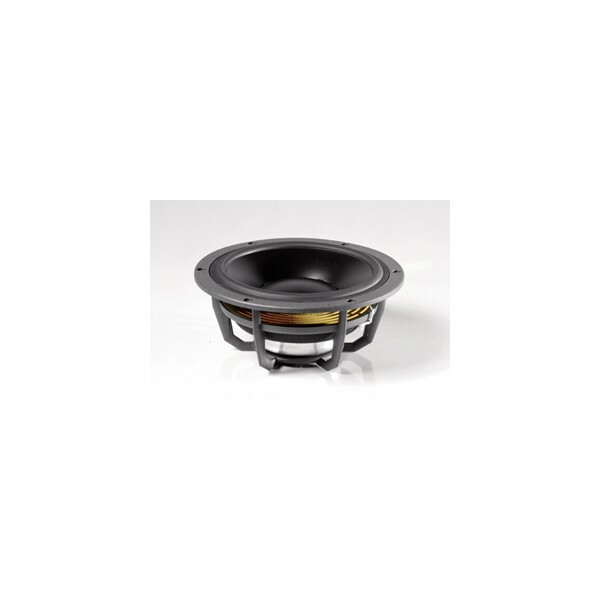 The 15, 17 and 20 cm Esotec MW car series woofers all utilize new ultra compressed dual ferrite magnets positioned inside the coil to produce maximum utilization of the magnetic energy. The powerful double magnet system utilizes a vented pole piece for additional cooling. Positioning the magnet structure inside the voice coil enables the use of a very large voice coil, which in turn produces increased power and efficiency and yields a linear movement of the cone without breakup. Phase response is smooth and uniform. The large diameter of the voice coils provides optimum drive of the diaphragm and guarantees enough headroom with regard to power rating, while assuring perfect control of even the most minute membrane displacement. The use of a large diameter voice coil also allows for the flat Dynaudio MSP cone membrane geometry, which results in minimal phase lag at crossover to midrange driver. The MW 172 is a perfectly balanced driver with excellent dispersion, a linear frequency response and an extraordinary absence of resonance, rendering it ideal for anchoring even a high quality two-way system even with its relatively large cone diameter. Is the price for a pair ? hi,how much for the grilles? Please call 0845 600 7160 or email your enquiry on the link below. how much for the grilles? Please email your enquiry on the below link to obtain a price on the grills. id like to buy 1 of these plus grilles. Please call 0845 600 7160 or visit your local store. how much for the grilles on mw 172? Please call 0870 600 7160 or visit your local store. hi,can you supply grilles for Dynaudio Esotec MW 172 8" mid/woofer driver 20cm?